I was at our local Walmart today picking up birdseed and discovered a row of Christmas items set just one aisle back of the Halloween items. Hmmmm… October 9th and Walmart is already working on their holiday sales… which got me to thinking that with only 76 days until Christmas, it's high time to get our websites ready for the biggest sales event of the year. 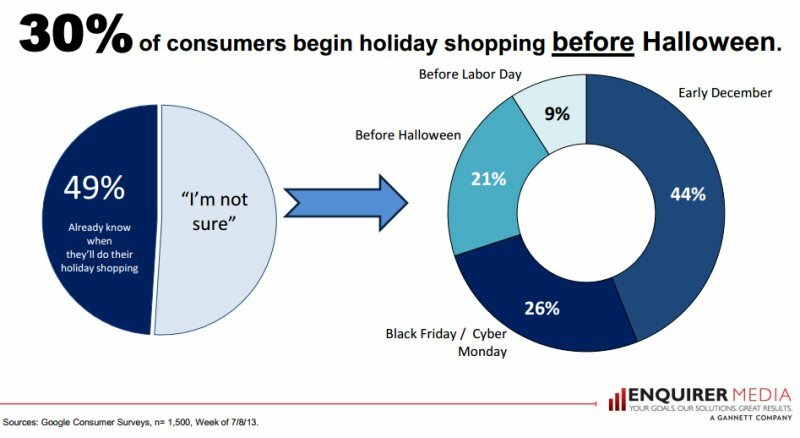 According to a report by Enquirer Media based on a Google Consumer Survey taken in October 2013, 30% of consumers begin holiday shopping before Halloween. I happen to be one of those shoppers — I usually have 95% my Christmas shopping completed before Halloween. Anyway, research indicates that we, as online marketers, need to be prepared as early as possible for holiday campaign marketing. Here are ____ to get ready to make the most of our online sales over the holidays. For example, if you sell toys, do a Google search for ‘toy trends' or ‘toy trends 2014' and you'll see what the Toy Association and all the big industry players in the toy industry are touting for the current season. Also, check Google Trends to confirm industry reports. Take a look at your sales since last Christmas to determine which of your merchant partners your visitors prefer to buy from most often. Focus on the offers that those merchants suggest. As an affiliate marketer, you will receive hundreds of emails from your merchant partners, either directly or by checking into your affiliate network's interface during the weeks prior to the holidays. Pay particular attention to those that offer FREE shipping. MOST of your merchants will have some sort of free shipping offer in the works. Look for those and promote them throughout the rest of the season. Too, make sure you add “FREE shipping” banner ads from your favorite merchants to your sidebars. Write (or buy) new reviews for what you anticipate will be your best-selling products, and make sure you have your autoresponder set up to send blog broadcasts to your subscribers. Your visitors will differ in their desires to buy high to low-end products. Be sure to offer products from a wide variety of price points. MOST people are looking for a deal that can MOST often be found only online. Look for those ‘special online offers' and create a top 5 or 10 list especially for that type of product offer. If you now post to your blog only weekly, increase your frequency to at least 2 or 3 times per week during the holiday season. If the information you share goes beyond obvious sales promotions and touches your potential customers' hearts, you will increase your sales volume during the Christmas season AND increase your subscriber base for the following year. Each of these steps is simple to implement to get your online business ready for the holidays. So get going and take advantage of the most lucrative time of the year. I just read the other day on ProBlogger anout writing daily and lengthy blogs somewhere in the ballpark of 2000+ words per blog post to get more love, backlinks, better indexing and search engine rankings in Bing, Google, and YaHoO!. I also checked out BloggingFromParadise blog and he has pretty long blogs. He only blogs 1 a day, but his US Alexa rankings are awesome, being that his blog was just started virtually 4 months ago.